Provide comfort for the family of Linda Deskins with a meaningful gesture of sympathy. Mrs. Linda Sue Deskins, age 79, of Aiken, South Carolina, formerly of Honaker, Virginia went to be with the Lord on Wednesday (December 19, 2018) at Aiken Regional Medical Center in Aiken, South Carolina. Born March 16, 1939 in Honaker, Virginia, she was a daughter of the late Hobert and Dorena Sykes Honaker. She spent her early life in Honaker, Virginia and was a 1957 graduate of Honaker High School. She resided in Ohio for many years and was employed at Rego Manufacturing in Bucyrus, Ohio until her retirement. After retiring, she moved back to Honaker for ten years, then on to Aiken, South Carolina four years ago. She was a devoted Christian and a member of Talatha Baptist Church in Aiken. In addition to her parents, she was preceded in death by her husband, Jerry F. Deskins. Survivors include one son, Larry Booth and wife, Sharon of Crestline, Ohio; two daughters, Dana Alley and husband, Richard of Gallipolis, Ohio and Renee Williams and husband, Mark of Galion, Ohio; eight grandchildren, Cristy, Nicole, Curtis, George, Erica, April, Michelle and Whitney; eight-great-grandchildren, Lilli, Kileigh, Mackensie, Brinley, Ella, Braxton, Aiden and Kase; one sister, Judy Honaker and one brother, Lanny Honaker and wife, Clarice all of Aiken, South Carolina. Funeral services will be conducted at 2 PM Sunday in the Honaker Funeral Home Chapel with Rev. Tom Edwards. Entombment will follow in the Ketron Memorial Gardens Mausoleum in Lebanon, Virginia. The family will receive friends at the Honaker Funeral Home from 1 PM until the funeral hour. 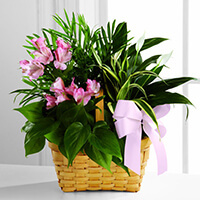 To send flowers in memory of Linda Sue Deskins (Honaker), please visit our Heartfelt Sympathies Store. Mitchells and Vanderlips sent flowers to the family of Linda Sue Deskins (Honaker). I'm so sorry to hear of Linda's passing. I have been praying for your family. So sorry for the loss of Linda, she always had a smile when I seen her. Just know she was an angel flying to close to the ground and now she is in heaven where wings are never broken. May God bless you all at this time. With love and sweet memories of Linda Sue! Mitchells and Vanderlips purchased the The FTD Living Spirit Dishgarden for the family of Linda Deskins.